In a personal essay, Robin Richmond rakes over the coals of controversy in what she says is the far too hermetic world of conservation. But she feels that that multiple and conflicting viewpoints over conservation/restoration are a sign of good health. Growing up in Rome is a humbling experience for an aspiring artist and art historian. Surrounded by great art and architecture – literally on the street corner where I picked up the school bus – I learned up close and personal about what Rose Macaulay memorably called the Pleasure of Ruins. This eponymous book was the first volume in my nascent art library, and my beginnings as a painter were indebted to its premise that the accretions of Time were noble and even desirable in the “look” of cultural artefacts. The Eternal City was made of broken roads, crumbling frescos, ruined buildings and monuments, termite-addled panels, mouldy canvases, and moth–eaten textiles. The local churches around our quarter displayed all these divinely decadent qualities – Caravaggio was one of my more illustrious neighbours – and the chipped teeth of Roman columns on the corner of our building, ascribed hubristically and incorrectly as Palazzo Bramante, were all deliberate style elements in my paintings. Not uncommonly for a young person of the 60’s, all wild pre-Raphaelite hair and all, I fully subscribed to William Morris’ utopian ideas. Home-spun clothes and a yearning for the communal were staples of the hippie movement to which I aspired. The sister and brotherhood beckoned us neophyte idealists. Even if I didn’t like his painting, I liked his wallpaper, and my admiration of the Society for the Protection of Ancient Buildings (which he had founded over a hundred years before) was fundamental to my understanding of the maintenance – and restoration – of what we now call “cultural heritage”. Today, this heritage is cleaned, stabilised, preserved, re-built, repaired and sometimes left in its original state in accordance with the more morally neutral term conservation, implying the possibility of intervention by conservators on a spectrum from nought to a full re-thinking of the work, whether it be building, music, object, photograph, film, video, installation or work of art. The concept might more clearly be defined as restoration. The art historian Cesare Brandi is a seminal figure in the field, and his name appears often in this superb book* and the accompanying symposium. He is a towering figure, and as the first Director of the Instituto del Restauro in Rome in the 1950’s, he defined restoration clearly. It is “the methodological moment in which the work of art is recognised in its physical being, and in its dual aesthetic and historical nature, in view of its transmission to the future”. Importantly for the future of conservation he rejected “artistic or historical forgery (and) without erasing every trace of the work of art’s passage through time”. This focus on time is crucial. My own approach was informed by the trauma of the 1966 floods which had besieged Florence. My school in Rome ran a collection fund and when we made a field trip to the traumatised city later that terrible winter I formed the view that William Morris’s philosophy – embodied in a typically functionalist clunky phrase, “anti-scrape” – was the correct one. I was not sure if Donatello’s statues, Ghiberti’s doors or Cimabue’s crucifix should be messed about with at all. This “minimalist” approach was key to my approach to art conservation at this time. Damage to art and architecture should be kept to the minimum of course, although the concept of ecology was unknown to me, I knew that we should all take the greatest care of our environment and the things within it that we can, but neither “heritage” nor “intervention” were yet buzzwords. An act of God – a Biblical flood for example – was the event that was the exception that proved the rule. The contradictions inherent here turn out to be well discussed by Salvador Munõz Viñas where he uses Zeno’s paradox to illustrate the point that the only minimalist intervention of a work is to do nothing. To act or not to act is a central theme in most great literature. It is also the mantra of the conservator, and the well-argued material, historical and philosophical implications of action and inaction make this book required reading for the academic, architectural and museum community. But it also aims to engage the thoughtful museum adherent and inquisitive art lover. It is also an essential text for collectors of art – both contemporary and historical. Why an artefact is prized and respected (and possibly conserved or not) and why another object is left alone is a fascinating reflection of society at a given moment. The values we hold are therefore culturally, socially and time specific. To let something go or to bring it back is a human question. What we conserve and why we decide to conserve, it is the big problem. There are no clear answers. Value judgements are subjective. How can they not be? After going to Florence in 1966 I thought my thinking crystal clear. Cimabue in tragic, sodden shreds was one thing, but any substantial repair to art or architecture was intrusive and the artist’s intentions – crucial to me – were inevitably lost. Where was the restorer who had psychic powers and who could communicate with the dead? Twentieth century science was fine for 20th century artefacts but inappropriate for more archaic work. Noxious flood water apart, the effects of Father Time were honourable and perhaps even highly desirable. I was sure of this because I walked up the notorious street of “antiques”, the Via dei Coronari, every day on my way home from school. Voyeuristically, I keenly followed the progress of paintings, sculpture, objects and furniture on their rapid journey from nowhere to somewhere, from nothing to something. Being young and no threat to their livelihood, somehow I was allowed to watch highly talented (and unscrupulous) “restorers” guide their wares on their lucrative way to the auction rooms. A table belonging to a certain Luigi miraculously became a Louis Quinze bureau and the view of the Venetian lagoon belonging to the guardiano who looked after the cars on the piazza somehow became a Guardi. When in the mid 1980’s I was asked to write a book about the controversial cleaning of Michelangelo’s frescoes on the vault and altar wall of the Sistine Chapel, I was unsure that I was the right person to do the job. Growing up with the foxed, cracked and crepuscular Michelangelo on the ceilings and walls, I had a strong attachment to what I thought of as their essential selves. With what Roland Barthes calls the “terror of uncertain science” I was sure that that the art historian in charge, Fabrizio Mancinelli, and his lieutenant Maestro Colalucci and their merry band of men were surely involved in altering and re-painting the greater Maestro’s cycle of work. I was not alone. Controversy reigned, often expressed by people who had not seen the work in progress in person. This informed my own initial approach. Time magazine’s reproductions of the clean frescos looked like Disney animation cells – all vivid, psychedelic colour and nothing like Michelangelo’s subtle monochromes – but over 10 years of regular visits to the work in progress on the scaffolding and in front of microscopes in the Vatican laboratories led to a Damascene conversion and I have had an abiding interest in the ethics of conservation ever since. Ever attracted to the controversial, I have had the privilege to observe, at very close hand, projects as diverse as London’s National Gallery’s work on the Wilton Diptych and Holbein’s Ambassadors, Masaccio’s Brancacci Chapel frescos in Santa Maria del Carmine in Florence and Leonardo’s Last Supper in Santa Maria delle Grazie in Milan. The extraordinary fact is that not one of these august projects used the same ethics, codes, materials or mindsets and there was little consensus about what was desirable in the “finished” object. Should all conservation be reversible? Many conservators would say this was essential. Should acts of conservation be visible to the naked eye? Many conservators would not agree. This provocative book addresses anomalous thinking in all kinds of ways. It is a vibrant, multi–facetted volume that in clear language addresses the wideness of the subject and displays a variety of argument that manifests the complexity of an unified theory and practise in the field. In Dinah Eastop’s talk and book chapter she cites, as an example of non reversibility, a Gamelan orchestra in the Asian Civilisation Museum in Singapore. To be played and tuned – much less conserved – involves an irreversible process of filing and hammering. This, of course, changes the object forever. Is this right or wrong? One of the founder thinkers of ethics in conservation is Jonathan Ashley-Smith. He is a key personality in the book, the symposium and in the debate at large and above all, advocates tolerance and diversity. Art and architecture are ultimately human constructs. 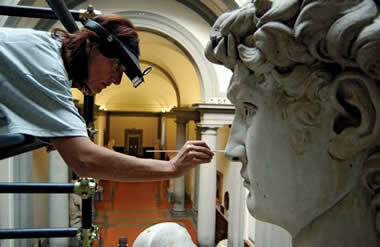 Its keepers are human too, whether they be curators, conservators, collectors, museum directors or the public at large. In very important ways conservators hold the beating heart of the culture in their careful, fallible hands and more should be written about their work which takes place in the far too hermetic world of the museum or studio. This book opens a window on a surprisingly highly volatile and contentious world. Nicholas Stanley-Price, in his chapter "The reconstruction of ruins: Principles and practice", proposes that one uncomfortable truth is the 'gulf that exists between the statements of Charters and the World Heritage Convention guidelines and actual practice'. Educational value has led to the reconstruction of many ruins in spite of the existence of international codes that guide against it. 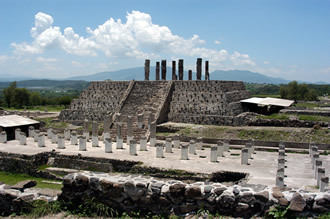 For example, the ruins of Pyramid B at Tula, shown here, were reconstructed in 1941 even though there was insufficient knowledge about their original state. How we preserve and conserve our heritage is profoundly descriptive of our core values as a society. The editors and organisers of the symposium, Alison Richmond and Alison Bracker, have deliberately chosen their contributors to evoke diversity and contradiction. They introduce the notion of relativism by highlighting a seminal moment when, in 1816, the Italian sculptor Antonio Canova refused to comply with Lord Elgin's request to restore the damaged fragments of the Parthenon sculptures, a gauntlet was thrown. This literal “conservatism” is contrasted with another Greek project undertaken in the same year. The Danish sculptor Bertel Thorvaldsen added “ heads, limbs, drapery and armour” to the Temple of Aethina at Aegina. Unlike Canova, he had no qualms about such reconstruction, embodying a form of cultural relativity. The “changing criteria” argument is an approach that seems one of the common threads in the book and conference. It was well illustrated for the general public in 1987. An act of psychotic vandalism with a sawn–off shotgun occasioned a six-inch hole in the Virgin’s chest in Leonardo’s Virgin with St. Anne and St. John the Baptist. In 1805, a musket ball ripped a hole in Admiral Lord Nelson’s jacket as he stood on the deck of the Victory at the Battle of Trafalgar, mortally wounding the great hero. In one instance the hole was preserved, in the other it was conserved. Thus the “changing criteria” argument illuminates the impossibility of hard and fast rules and illustrates why consensus is surprisingly rare in the world of museums. Where one institution favours minimal intervention, another re- paints. The editors argue that the chapters, though “highly varied in their scope, focus and methodology, all expose the uncomfortable truth of the impossibility of singular truths within cultural care and management. I agree. On the evidence of this book we are a long way from Ashley-Smith’s characterisation of the classic conservator being a “blind-folded lady holding a cotton bud” and a “manager of dusters”. The field of conservation ethics is dominated by principles, wracked by dilemmas, and sitting on some very uncomfortable truths – all expressed coherently and provocatively in this book. A good conservator is an anxious one; eyes, mind, heart and brain fully open, cotton buds and dusters possibly at the ready.